. 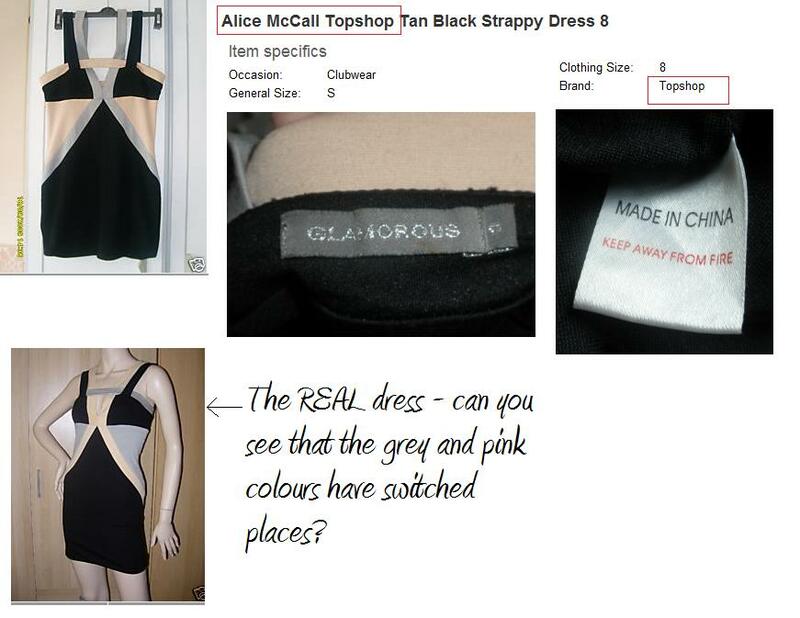 I recently 'won' an Alice Mccall for Topshop dress from ebay and was super excited for it to arrive but twitterworld has made me a bit of a skeptic now so I decided I would have a closer look at the dress and.. It is a good copy I will give them that but the colour scheme is incorrect, it says 'MADE IN CHINA' and most obviously the label inside says 'GORGEOUS' instead of 'TOPSHOP' !? How did the seller think she could get away with passing it off as a designer item from Topshop when it has that as the label. I checked the item page again in case I had missed it saying 'in the style of/topshop style' - but it clearly claims it is a Topshop item. On the item page it says 'no returns' but I've emailed her explaining how it is clearly a fake and the Topshop store confirmed this for me and if she does not allow me to return it for a full refund I will leave her negative feedback and report her to eBay. Ugh. This is such a hassle. As annoyed as I am I have to say thankyou to you twitterfolks who have now made me into s super-spy detective haha. Must be pretty annoying for all these sellers who I am now suddenly questioning about authenticity! On a serious note trying to pass off something as genuine when you know it is a fake is really pathetic and dishonest in my opinion. It's a very very low thing to do and I'm glad I am more aware that it happens! 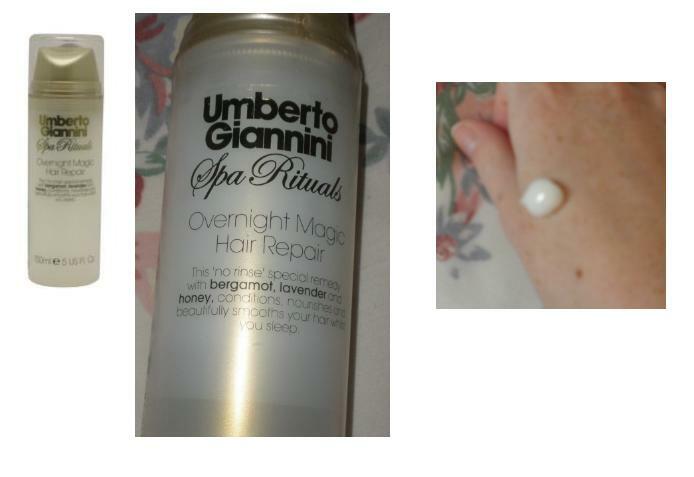 Umberto Giannini Spa Rituals Overnight Magic Hair Repair's 'no rinse' special remedy with bermagot, lavender and honey, conditions, nourishes and beautifully smooths your hair whilst you sleep. This is, obviously, a product that is going to offer a merely superficial softness to your hair and not give any long-lasting benefits to the condition of your hair but sometimes you just want a little pick-me-up and for your hair to deceptively look healthy and shiny (even if you know in your heart you've been going crazy with the GHD's) and this product does exactly that! In the picture I have tried to show what the product is like - it has the consistency of a thick but normal hair mask and when you apply it through the ends of your hair it does immediately make it look greasy/damp and is not very nice, furthermore the smell is quite overpowering (my boyfriend hates it) however, if you comb it through after about 10 minutes you will be left with hair that looks and feels just a tiny bit damp and the miracle is that when you wake up you are left with absolutely no trace of this product in your hair whatsoever! Your hair will be completely dry, not sticky or oily - but just slightly softer and healthier feeling and looking! At £4.99 this is within most budgets and a little goes a long way so the product lasts. I believe it to be a worthwhile investment and it does what it says on the tin! Maybelline 'Volum Express ! - Look how many I have !!!! I have used this mascara almost every day for about 4 years now and always repurchase it. 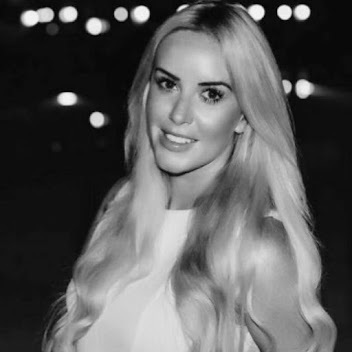 This is my staple HG mascara, I use on average about three-four mascaras every day to achieve my big spidery eyes look but the combination of mascaras I use changes constantly yet this one remains a constant in my make-up routine. 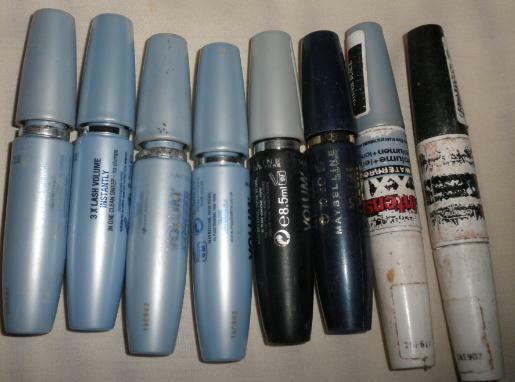 The light blue one is my faavoourriitee (as you can see) and the other mascaras are all by Maybelline and the brushes and formulation are all very similar (but not quite as good!). A tip which I picked up from a friend is if you accidentally dry out one of those mascaras, or use it up super quickly (which i do) then you can use the drier mascara as a 'first coat' for the lashes which essentially does the same job as an eyelash curler or a lash primer and when you have finished your lashes you can use that same drier mascara wand to separate the lashes and really achieve that 'wide eyed' look! I would recommend this mascara to anyone I think it is fabulous, I will do a proper review with photos soon when I can wear mascara again but honestly it gives massive length and volume and makes your lashes jet black. I am super keen to try out Covergirl 'Lash blast' Lancome 'Hypnose' and I think I have been persuaded to buy the vibrating mascara from Maybelline (tut tut on you all for your great pictures!) BUT I know that I will be using those mascaras in conjunction with my Maybelline mascara because nothing will ever ever beat this mascara! On a side note - I can't believe you Maybelline Bloggers got that 'Great Lash' mascara from the event - it's bloody RUBBISH! I'm not sure who decided to make that mascara a 'cult' mascara - but it's awful. Ugh. Anyway, going off on a tangent now. I can't wait until I can start wearing make up again and blog properly!